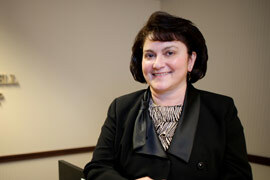 Lori Whitten is one of the attorneys who joined HCP at its founding in 1999. She became a partner in the firm in 2006. Her practice is in the Employment Law Group, which represents employers throughout the state in civil and administrative proceedings. Presently Lori represents employers in retail and wholesale food processing, light and heavy manufacturing, interstate trucking, gas and petroleum processing, and transportation, as well and a number of commercial and health care facilities. Lori has handled Industrial Commission hearings and numerous other related Court proceedings, dealing with workers’ compensation issues over the past 19 years. In addition to workers’ compensation, she has also handled matters involving unemployment claims, allegations of wrongful termination of employment, as well as mandamus actions as counsel for both relaters and respondents, all dealing with various issues in connection with workers’ compensation claims. Lori grew up in Green Bay, WI and Sault Ste. Marie, MI. She remains an avid Packer fan. After graduating from college in 1986, she moved to Ohio and has been here since that time. She is now also an avid Cleveland Browns and Cleveland Cavaliers fan. In addition to her love of sports, in her spare time, Lori likes to read, golf, and spend time with her husband and two kitties. Lori was previously employed by Buckingham, Doolittle & Burroughs, LLP, beginning June 9, 1986, as a paralegal in the Trial Department. While working full time in that capacity, she attended night school at the University of Akron School of Law and graduated in May, 1992. Following her admission to practice before the Ohio State Bar, Lori worked in the Employment Law Group for Buckingham, Doolittle & Burroughs, LLP until she changed firms and began working with Hanna, Campbell & Powell, LLP on November 1, 1999. Ms. Whitten has been named counsel in 18 mandamus actions at both the Court of Appeals and Ohio Supreme Court levels. Ms. Whitten has also tried several cases to jury and/or court verdict.